The Page 99 Test: Christopher Lane's "Surge of Piety"
Christopher Lane's "Surge of Piety"
Christopher Lane, a winner of the Prescrire Prize for Medical Writing, teaches at Northwestern University. A former Guggenheim fellow and a Victorianist by training, he has a secondary interest and specialization in 19th- and 20th-century psychology, psychiatry, and intellectual history, and has held Northwestern’s Pearce Miller Research Professorship. 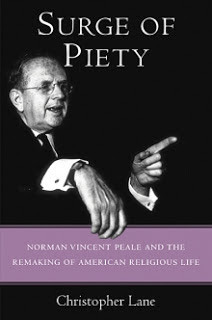 He is the author of six books, most recently Surge of Piety: Norman Vincent Peale and the Remaking of American Religious Life. His other books include The Age of Doubt: Tracing the Roots of Our Religious Uncertainty and Shyness: How Normal Behavior Became a Sickness. Surge of Piety focuses on the role that Peale played in promoting the massive wave of religious sentiment that swept the nation in the 1950s, much of it orchestrated by his ministry and allies, and concentrated in the Congress, Pentagon, FBI, and White House. Opening in the Great Depression, the book draws on far-reaching but neglected archival evidence of Peale’s role as a hardline conservative activist when, politicizing his ministry, he repeatedly attacked FDR’s New Deal as “un-American” and Roosevelt himself as “indifferent to religion,” though the four-term president was in fact anything but. One of Peale’s most lasting and least discussed legacies, the book brings to light, was his well-funded campaign to align religiosity with mental health, to make religious belief a prerequisite for individual and national prosperity. Though the American Foundation of Religion and Psychiatry, Inc., an evangelical organization he co-founded in 1953, Peale succeeded in making American medicine issue a “proclamation of faith,” turned what he called “religio-psychiatry” into a national movement, and persuaded millions of Americans that the solution to their and the nation’s problems were religious in character. In the immediate aftermath to our own recent presidential election, when the political and cultural landscape seems yet more divided, we can only hope the nation will unify around policies and platforms that don’t repeat the turbulent, bruising history documented in Surge of Piety. As but one way forward, my Coda, “Faith as an Ongoing Force,” looks at strategies for reining in religious extremism while also acknowledging the complex ways that religious beliefs continue to shape our politics and society. Learn more about the book and author at Christopher Lane's website. The Page 99 Test: The Age of Doubt. Dominic Janes's "Oscar Wilde Prefigured"
Kenneth Stow's "Anna and Tranquillo"
Jessica Winston's "Lawyers at Play"
Laura Alice Watt's "The Paradox of Preservation"
Avery Kolers's "A Moral Theory of Solidarity"
Heath Brown's "Immigrants and Electoral Politics"
David Grinspoon's "Earth in Human Hands"
John Powers's "The Buddha Party"
Meghan K. Roberts's "Sentimental Savants"